Researchers in Poland and the Czech Republic have elucidated the mechanism used by DNA to repair dimerised thymine bases.1 The findings could help researchers understand why nucleic acids emerged as genetic information carriers on early Earth and how life flourished. DNA damage is one of the worst consequences of UV light exposure in living organisms. Cyclobutane pyrimidine dimers are a common cause of DNA lesions, which are frequently behind skin cancer. DNA has evolved sophisticated repair mechanisms using enzymes to return itself to its original state. Back on Archean Earth, such repair mechanisms were yet to exist but DNA lesions would have been more common. On this primordial world, more UV-light would have reached the surface, as the atmosphere lacked oxygen and the sun was more active in the ultraviolet spectral range. When adjacent thymine bases dimerise (T=T), they make cyclobutane pyrimidine dimers. 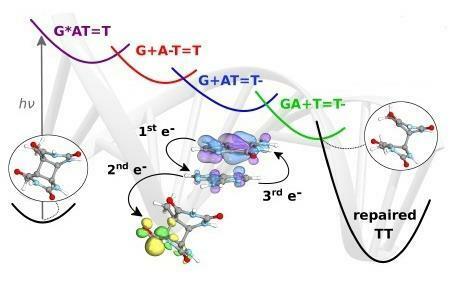 Two years ago, scientists in Germany found that the DNA sequence GAT=T could repair this DNA lesion itself.2 Following on from this discovery, Rafał Szabla from the Polish Academy of Sciences and his colleagues, elucidated the mechanistic details of DNA self-repair in GAT=T oligomers using molecular dynamics simulations, and quantum and molecular mechanics computations. Szabla chose DNA rather than RNA to carry on the work performed by the German group. However, Szabla expects the principle of action to be the same for RNA and this is important, as RNA is believed to have been the first informational polymer on Earth. The self-repair occurs using a sequential electron transfer mechanism. 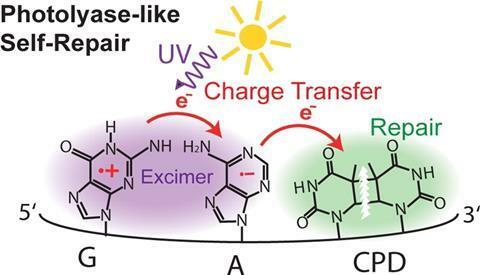 Szabla says ‘UV-light can induce charge-separation within a single DNA strand. In other words, soon after the strand absorbs UV light, the excess energy coming from the photon can result in the formation of positive and negative charges on neighbouring bases.’ Szabla goes on to explain that the spare electron travels along the DNA strand, hopping from one base to another. ‘This electron has preferential directions in its movement and it quite willingly attaches to the damaged site. The electron simply searches for low energy arrangements and the system has lowest-energy when the electron resides on the damaged fragment.’ Szabla explains. After this, the electron spontaneously induces a simple repair process, which results in the formation of the original biological form. Andreas Dreuw from Heidelberg University, Germany, uses theoretical and computational methods to investigate photo-initiated processes. He believes the study by Szabla is an excellent piece of quantum chemical research in the field of photobiology and the proposed mechanism is a major advance in the understanding of the photochemistry of DNA. ‘It is a possibility that the availability of this self-healing mechanism in nucleobase oligomers provided a decisive evolutionary advantage for nucleobases to be selected as a “stable” carrier of genetic information,’ Dreuw adds. Szabla says he plans to screen other sequences for similar properties and assess their efficiency in conducting self-repair.